A practical kitchen layout that maximises the potential of smaller spaces, U-shaped kitchens are a popular choice for many when designing a kitchen. In addition to prioritising storage and work surface space, they're also effective at creating an efficient kitchen work triangle. Whether you're blessed with a large, light and spacious kitchen or have a small but equally mighty space, opting for a U-shaped design is not only a practical decision, but has plenty of style potential, too. Find out all you need to know about planning, designing and budgeting your new kitchen in our ultimate guide. If your home has an open-plan feel (or you want it to), opting for a U-shaped kitchen layout can be an effective means of zoning a large, open space. Positioned in a corner with one side of the U forming a peninsular unit, it creates a clear distinction between the kitchen and dining or living areas. This is achieved effectively with this Fusion White Kitchen from Magnet, which is positioned effectively in the corner of a larger, open plan space. The addition of a breakfast bar and stylish bar stools helps create the link between zones. If you want any more advice on how to plan an open plan kitchen then make sure you check out our guide. Opting for a U-shaped kitchen layout is effective in making a small space seem larger and lighter, while making the most of storage and work surface opportunities. Choosing flush-fronted, handleless cabinetry dials down the fussy detail to enhance the feeling of space further. White kitchens, as well as those with grey tones, work a treat if maximising the light and bright feel of your space is a priority. We love this combination of sleek and contemporary white and grey toned cabinets with retro features – hello Smeg Fridge – and bold brass fittings from Norsu Interiors. If you love this kitchen then lucky for you, we have a whole gallery full on inspirational white kitchen designs, and grey kitchen designs too. Creating a focal point is an effective means of making a kitchen feel more pulled together. In a U-shaped space, pendant lighting is a great option, especially if one side of kitchen cabinets opens out onto an open plan space. We love the idea of glass pendant lights, which create the design impact required without sacrificing the light and open feel of the kitchen. P.S. We have loads more advice on the best kitchen lighting. While a major perk of the U-shaped kitchen is its ability to offer abundant storage potential, opting for kitchen cabinets both above and below counter level can result in the room feeling crowded and therefore smaller, especially if you're working with darker woods or colours. To counter this, consider opting for a combination of kitchen cabinets and open shelving units, which will make your space feel larger and more open. Style with your prettiest kitchenware. One of the major benefits of a U-shaped kitchen is its storage potential. Worth considering during the kitchen planning and designing stage is how you intend on maximising storage solutions. 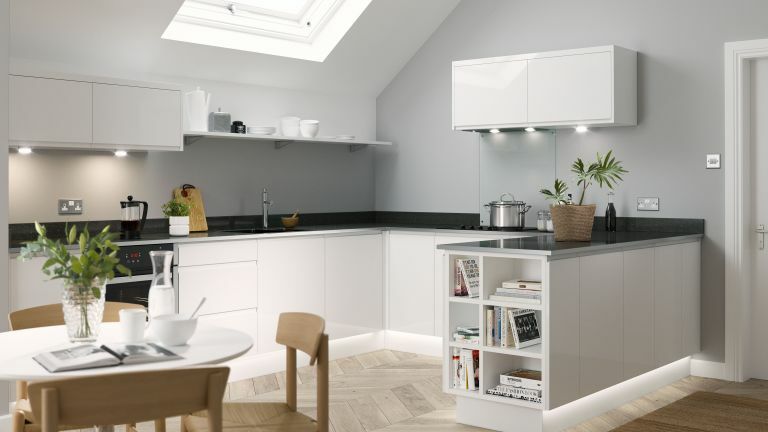 Specially designed corner storage systems are worth the investment in a U-shaped kitchen, while your ratio of deep drawers to cupboards to shelving units should be carefully calculated to suit your storage needs. We love the way this J Pull Kitchen from Wren Kitchens uses a shelving unit to create extra storage at the end of a row of kitchen cabinets; perfect for storing cook books. Choosing the best tiles for your kitchen is an important design aspect and can make all the difference in terms of the final feel of a space. If you're dealing with a small, U-shaped kitchen, working with light coloured tiles is a well known design trick that will make the space feel larger and lighter. A slightly lesser known design trick is to lay tiles diagonally – this take on a herringbone effect is a great example – as it fools the eye into seeing a space as larger than it really is. Like that tip? Our guide to choosing the right size tiles for a small kitchen has plenty more. You're welcome. Typically more angular, U-shaped kitchens are perfect for channeling your love of all things, bright, bold and patterned. Choose a different finish for each surface; we love the idea of botanical wallpapers, bright toned metro tiles and painted cabinets – the bigger and bolder the clashes, the better – to achieve an on-trend, maximalist look. If you're blessed with a large and naturally light space, don't shy away from a U-shaped kitchen inspired by the dark and atmospheric interiors trend. We love the dark finish of this kitchen. Despite its dark and inky floor to ceiling kitchen cabinets, abundant natural light prevents it from feeling small and boxy. The use of a freestanding Vadholma Kitchen Island, available at Ikea, also contributes to the kitchen's open feel. When choosing appliances for a U-shaped kitchen, opting for built-in appliances is a great way to achieve a sleek and contemporary finish. We love the distinctly contemporary feel of the extractor fan in this kitchen from KreateCube.